Please enter your activity as early as possible. The Invitation & RSVP email should be sent at least two weeks before the activity is to occur. Promote as Featured Event on Event page: Yes, if it is a tour or an activity that we do not offer on a monthly basis (exclude Tuesday activities and swimming). Show this event on the public group website: No. After all the fields are filled in, click “create”, then review the calendar entry for errors. If edits are needed, click “Edit this Event Instance” (in the red-outlined box in upper right-hand corner). Once everything looks good, click “Send Notification”, also located in the red-outlined box, which takes you to to a page where you choose the method of notification. First notification is "Invitation and RSVP", sent at 2 weeks (or greater) before the activity. Delivery method should be "Post to Group Forum". Second notification is "RSVP reminder", sent 5-7 days before the activity (or as appropriate), to remind of when RSVPs will close. Delivery method should be "Post to Group Forum". Third notification is "Reminder", sent one day before the activity. If RSVPs are closed and/or the event is at capacity, delivery method should be "Email Interested Members". This option will result in an email going out to only those who have RSVPd yes or maybe. This is important, since there is no need to remind the entire group about an activity that is no longer available for RSVPs. In the “Address” field, in order for the map to be generated, the entire address (city, state, zip included) needs to be entered. 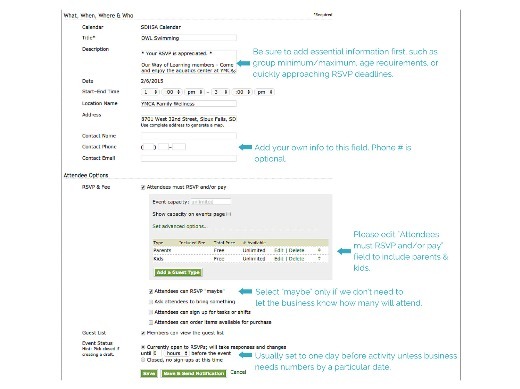 If there is a limit to the total number of people (parents and children) who can be accommodated by the business or organization at which the activity will occur, use the “Event Capacity” field to enter a maximum number. If not, leave that field blank. You will need to edit the “guest type” If this is the case, do not enter any numbers under "Event Capacity" (even though it would seem that you are leaving the default number at unlimited), then enter the guest types and # of spots available. 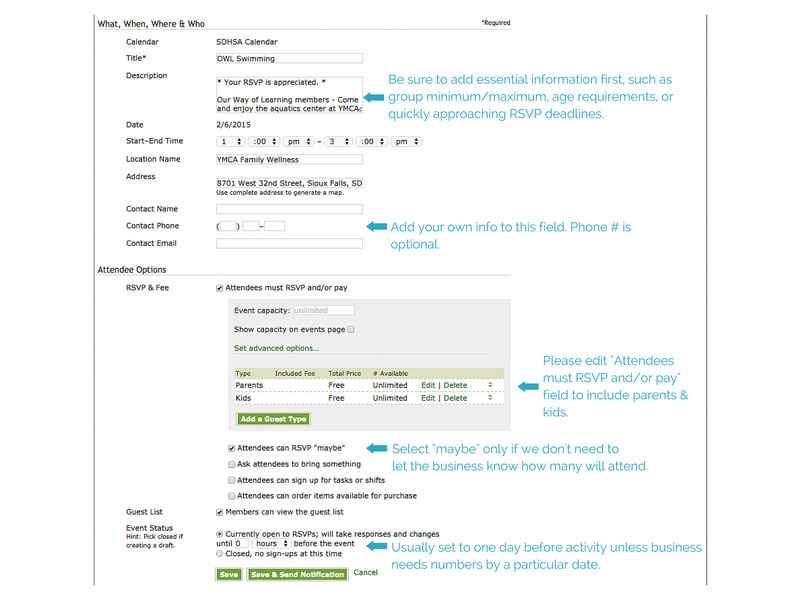 To make extra sure that the numbers are entered appropriately by those RSVP-ing, entering the guest type as “Children Only” or “Adults Only” is a good idea. For particularly big events, or important changes to events, we can also set up a notification to go out as a news event. Let Mel know if you need additional web support. When necessary (or just helpful :), pages can be posted for special events.